WW1 Reenactments Equipment : Great War Tommy WW1 Documents, Paperwork : 2 Ballistite Ammunition tin labels, 1917-1918. WW1 Reproductions and WW1 Reenactors Equipment / Kit - 2 Ballistite Ammunition tin labels, 1917-1918. 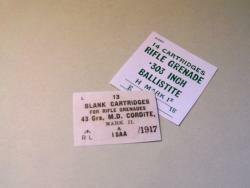 2 Ballistite Ammunition tin labels, 1917-1918.